When most of us think of back strengthening exercise we imagine those big bulky bodybuilders we see on t.v. doing the clean lifts with huge barbells throwing them on the floor and watching them bounce. How about those same guys using the back extension machine in the gym with 200 lbs on it going from a deep flexion forward to a back hyper-extension. These exercises are what they say; back strengthening exercises, but they are working the superficial or surface muscles. I want to show you some of my favorite exercises to strengthen the back from the inside-out! What I mean is....with Pilates exercises, we can strengthen the deep internal stabilizing muscles of the spinal column to ward off back pain. Then you can focus on the superficial or external muscles groups with less risk for injury. Now, let's get started with our back exercise workout! Any of the prone, or belly down Pilates exercises are working on the back extensor muscles while simultaneously working the deep transverse abdominal muscles that support our spine. Lying face down with arms over head and legs long and about hip width apart begin raising or lengthening one leg and the opposite arm only about an inch or two off the mat. Focus on keeping your pubic bone pressed into the mat, abdomen pulled up and in and breath steady as you alternate raising opposite arm and leg. You can move with short quick movements or work towards more extension raising the arm and leg higher but still keeping the torso still. You can progress from swimming to this kneeling back exercise, which adds the challenge of balance. Begin kneeling with your spine neutral, hands under shoulders and knees under hips. As you inhale extend your right leg and then add the opposite or left arm reaching over head. Hold until steady and then exhale as you bring them back to center. Repeat this exercise for 6-8 repetitions on each side. The Side Plank is a great way to strengthen the back muscles as it works the side oblique muscles that support our spines in twisting and bending movements. Begin kneeling on your side as shown feeling length out through the long leg and out the crown of your head. Hold until steady and then release to a sit. 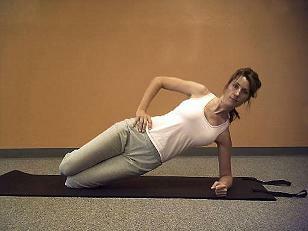 Repeat this Pilates exercise pressing up to the side plank on each side for a 3 count and 4-6 sets each. You may extend both legs to make this exercise more difficult as you progress. 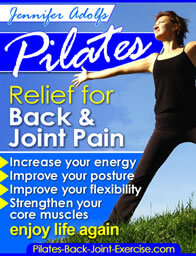 See these exercises and more back and abdominal exercises in the Newly Revised Pilates Ebook here. 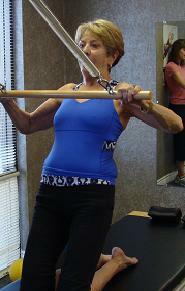 One of my favorite ways to strengthen the back muscles is using the spring tension on the Pilates equipment such as this lat pulling exercises. This Pilates equipment exercise can be done with a high bar, pulling your elbows wide and your shoulder blades together as you bring the bar to your chest. Pilates-based exercises are important to your back exercise workout because they focus first, on the deeper postural stabilizing muscles, and then you can begin to focus on the larger and more superficial mobilizing muscles. Leave Starting a Back Strengthening Exercise Workout and find more ways to keep your back strong and healthy.